Let’s get a few things out of the way. There are some who think the English language is evil and is destroying original Indian or Hindu culture. Their reason being, more schools are adopting English as the medium of teaching. This is one of the silliest arguments going around. English has not been a “foreign” language for Indians for a long time. It is the “second” language and also the “official” language of GOI. These folks suggest India must teach in the mother tongue just like France, Israel, Japan or China do. The problem with this is, India doesn’t have one unifying language like these countries. And except for China, these countries have tiny populations not comparable to India. If all states resorted to teaching all subjects in the home language one cannot imagine how a Tamilian will communicate with a Bengali or how a Gujarati will communicate with a Telugu. Besides, parochial Indian politicians have turned language into a “Conflict” issue. South fights Hindi, northern politicians try to promote or impose Hindi and it goes on and on. Often times, these conflicts have created riots. So, to suddenly throw away English and turn everything into local language is one dumb, stupid idea. Mother-tongue will be learned by kids anyway if parents and family use it. I happily speak five languages, including English, and no school has made me proficient in the local languages. I learned them with friends and their families. Secondly, rural folks are now catching up on English and it is no more a language of the few who became dominant and mocked Indians because of their English language skills. Even material things change. Once upon a time, friends or relatives returning from the US or the West used to bring goodies home for everyone. These things were not available in India. Even small things like high-end chocolates and stuff weren’t available in India. George Fernandes also banned Coca Cola from India. Today, there is nothing that a common man would want or need that is available in the US that is not available in India. Even perfumes and body-spray brands number in hundreds. Schools have unusually long hours, from 6 to 7, hours. Add commuting time of another hour or so and the kids nearly have a full office day. What do they with all this time? Absolutely unnecessary and can be cut down to school time of 4 hours. And these 4 hours can include a short and long break. 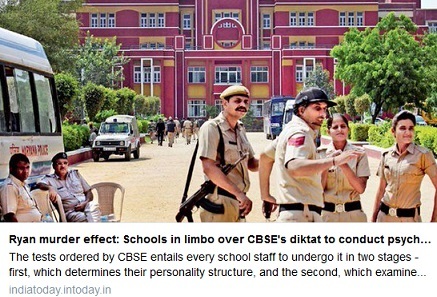 Even on I-Day and R-Day schools make it a torture for kids. Get up early, assemble and wait for over an hour for some guest. Flag hoisting done, a long lecture by a few followed by a long lecture by the chief guest. Brevity in this day and age of all these functions on TV seems to be lost on them. Schools can’t seem to cut down these functions to 90 minutes or so. Beyond that, every activity becomes boring like a long Bollywood movie. Excessive tests – From class-1 onward, there are monthly tests of some kind (or even fortnightly). For what? That’s like 15-20 tests every academic year. First term, second term, finals and a couple of class tests in between would do. Burdening kids with nonsensical tests is a pain and produces no real learning at all. Simplify the syllabus – Some people have commented in the previous part that “All subjects” are important. That is sheer nonsense. English (Or medium language), Math and Science are they key subjects. History, Geography, Civics etc can be bundled into one text book for just enjoyable reading and learning. There is no need to test these subjects so severely that kids have to cram facts. Even the history taught is mostly garbage peddled by Commies for a long time. Math is the foundation for multiple subjects. Whether science or geography, a good grounding in Math has to be the topmost priority. How to make teaching Math easier and enjoyable to learn has to be the highest priority for educators and govt. Sudden psychological tests will solve these problems? School education is a completely broken down, dilapidated building that deserves to be condemned to demolition. What is needed is a complete ZERO-BASE start-over to think through primary education all afresh from scratch. And the way to do it is to not hire or employ the moth-eaten brains that brought us to such a situation in the first place. 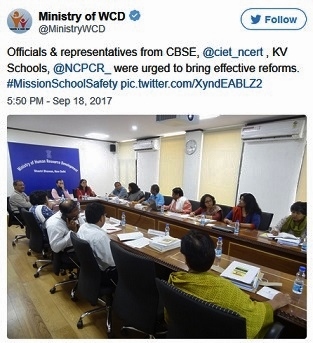 An absolutely new task force with fresh thinking with clear goal of revolutionising and simplifying school education is what is called for. No amount of lipstick and knee-jerk reactions will solve any problem. School-life for children has to be good and learning an enjoyable experience. Anything else is nothing but a bunch of jailors holding their prisoners for 6 hours. What a vision... Hope some sane mind from HRD is reading your article..
Schools have been functioning like assembly line factories where teachers follow set patterns. Free thinking is not taught to children. What we need is few limited hours of schooling and self study by students to open up new directions of thoughts for them. They can share and course correct next day in school with designated time with experts from different fields volunteering to teach special skills. I am sure parents of other children would more than be happy to contribute their experiences. A pragmatic approach is needed to change the patterns of teaching as models of learning. New ideas should be tried and old ones obsolete should be removed. Students should turn in to researchers and implement self thoughts for betterment. I agree with you regarding the I-day and R-day celebrations held by schools that ruin the holiday for those children. Especially this BJP government has gone overhead of imposing this sort of nationalism and patriotism in government schools. If required, keep the celebrations the day prior to the national holiday. Fantastic ideas. Focus on Math and Science, as also on reducing the number of school hours. Besides, I feel there is an urgent need to focus on personality development too. That is the single biggest differentiating factor between public and private schools. Children from the top of the line schools are more exposed to sports (usually more than one), music (both playing instruments and singing), much more confident (incl with public speaking) and generally more polished. True that some of that is also due to environment at home. But Govt. schools can at least make a start in this direction. But on English language, there is disagreement. Accepted that English is not that elitist any more. But given the sheer size (and population) of the country, the vast majority still lags behind mainly because the medium remains English, something which they neither converse at home nor can anyone within their families help them with. If people are taught subjects in their mother tongues, several more milliOns can come into the mainstream. As for communication amongst people from different states, that can still be done in English. It is not necessary to communicate in Queen's English. Tooti-footi English learnt as a second language should do. Both the parts on this topic are insightful and reflect the current state of affairs. However, let's take a couple of step back and look at what has brought the education system to the current state? The socialist mindset in India has ensured that only people with degrees and higher education from elite places alone form the classes. The question asked today is not "How good and productive to the society you are?" but "How much fame and/or money are you making irrespective of means"? Of course one should make money and/or fame to one's satisfaction but can that be at the cost of societal degradation? I am yet to see any educator thinking and asking this question. Envisioning a good society, the fundamental duty of educators is far away. Based on experience, I believe that most "prestigious places" round the world (including IITs and IIMs) are overrated. Seats to these elite places are deliberately rationed so that the Corporates and Universities have it easy to find their employees and maintain their stronghold. Ask the people running such Institutions to replicate the model, and they'll all run to find excuses. Worse, if ever other Institution try to compete, they are pulled down at the first possible instance with all possible means including crookedness. With this level of moral standing, how do we expect them to deliver? The other dimension to education is parents, students and their peers. Most parents want (and rightly so) the best for their children. In today's parental mental construct this is reduced to "well paying job". Hence, they'll do anything and everything in their power to push (no, make that shove) their children into one of these elite places. To hell with the child's capacity, inclination and interest. 1. Parents should imbibe and practice high standards of Dharmic values and traditions at home. Most kids learn by seeing and observation. What they learn at home is what builds their character and standing in society. Money and fame is secondary. A confident child will stand up irrespective of the adversaries surrounding. 2. Parents should choose right schools that are in sync with their practices at home. For instance I'm from D.A.V. Institution, I never had a conflict between what was taught at school and what was practiced at home. On the contrary, I've seen a lot of children (esp. convent ones) fighting with parents and doubly questioning them. In the end, parents give-in thinking "Oh! this is the way world is, let's change ourselves"
3. Governmental role in schools should strictly be restricted to ensuring that facilities and infrastructure are maintained. Bare minimal guidelines should be laid down on curriculum. Few key skills like language, Science and Mathematics must be emphasised upon. All national level board exams should be restricted to this alone at all levels. 4. Schools should have complete autonomy to decide what subjects to teach (apart from English, Math and Science) and how to teach based on surroundings and societal construct of the region. For instance, if students are talented and inclined towards say music or painting schools should be free to focus on this some focus on language, Math and science. Let the students' success be determined by the society at large. The Phogats and Mitali Rajs of the world are fine examples of such nurturing. 5. Finally, I think it's time to bring down elitism and snobbery existing in some of the high end "prestigious institutions". "Bare minimal guidelines should be laid down on curriculum." - not only minimal but maximum guidelines of books, hours, tests, subjects is needed more as Ravi writes in this blog. Children are robbed off their sleep, child innocence, baby upbringing and become mazdoor on altar of education. Add to this list all the things they were unable to achieve owing to various reasons. 1. Counselling parents about upbringing. This should include accepting the child as (s)he is and aid identify his/her natural areas of interests, inclination and talent. Then cultivate an attitude to encourage the child in that direction. Ravi's www.EducatingForward.com is doing good job in this regard. 2. Teacher training should focus more on assessing every child's potential. Also, the teacher should be free to create an environment for the child to achieve this. Teacher training today is pathetic in the country to say the least. They are at best parrots in a classroom. So, from a policy perspective, I guess the emphasis should be on teacher training for a bright future of the nation. They should be trained enough that every parent is confident of trusting their child with them. Appreciate UR down to earth thinking with deep foundation. Hello, I am Sanket Varak from Mumbai. Currently I am pursuing my Master’s Degree in Communication and Journalism from University of Mumbai. The reason to write you is, we have been given to write blogs for our academic purpose and a veteran blogger has to review the same in our comment box. I would be really grateful if you review my blog and help me improving my writing skills. I hope you give a positive reply.